St. Clairsville, OH (March 23, 2018) – For more than 25 years, students from local schools have displayed hundreds of science projects at Belmont College. The halls were recently filled once again with scientific inquiry. Photo caption: Chosen as the top project was that of Emma Connors (pictured left), a 9th grade student from East Richland Christian. 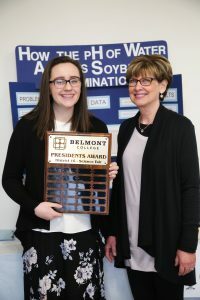 Her project titled “How the pH of Water Affects Soybean Germination” received the Belmont College President’s Award. She is pictured here with Dr. Rebecca Kurtz, Belmont College Vice President of Academic Affairs & Student Engagement. 85 students from seven local schools competed in the 2018 District Science Fair at Belmont College’s Main Campus in St. Clairsville on Saturday, March 17. Students from the following schools participated: Bishop John King Mussio Elementary; Bishop John King Mussio Jr. High; East Richland Christian; Harding Middle; St. Clairsville Middle; St. Mary Central Martins Ferry; and St. John Central High School. Guy Bucci, Bishop John Mussio Elementary; Emma Conners, East Richland Christian; Gracie Crumm, East Richland Christian; Noah Crumm, East Richland Christian; Luke Deptula, Bishop John Mussio Elementary; James Devereaux, Harding Middle; Lucan Galbraith, St. Mary Central; Joseph Green, St. Mary Central; Alina Handte, East Richland Christian; Liliana Hunt, Bishop John Mussio Jr. High; Sydney Koller, St. Mary Central; Natalie Lucas, Bishop John Mussio Elementary; Ella Maragos, Bishop John Mussio Elementary; Aiden McMillan, East Richland Christian; Kiera O’Brien, Harding Middle; Mackinnley Perkins, East Richland Christian; Isabella Phillips, Bishop John Mussio Jr. High; Alex Richards, East Richland Christian; Drew Roberts, East Richland Christian; Nash Roberts, East Richland Christian; Issaac Sharp Rosel, Harding Middle; Matthaias Sacco, St. Mary Central; Tim Stoffer, East Richland Christian; Danica Stoffer, East Richland Christian; Sophia Talamonti, East Richland Christian; Alaina Thornburg, East Richland Christian; Liam Tomlin, St. Mary’s Central; and Kaylynn Yockey, East Richland Christian. Chosen as the top project was that of Emma Connors, a 9th grade student from East Richland Christian. Her project titled “How the pH of Water Affects Soybean Germination” received the Belmont College President’s Award. Chosen for the Runner-up Award was Tim Stoffer, an 8th grade student from East Richland Christian, for his project titled ” Does Blue Light Impair Reading Speed and Comprehension?” This is the Excellence in Science Award, sponsored by the District 16 Science Fair Committee. Additionally, Ellen Rohde received the American Electric Power Award, while the following students received the Ohio Tuition Trust Authority Scholarship: Dillon Aria and Jillian Bocci. The following students received recognition and a camp scholarship from BWiser Institute: Grace Balzano; Jillian Bucci; Liliana Hunt; Vanessa Murphy; Maria Myers; Sarah Rechen; Ellen Rhode; Elliana Rice; and Ava Zelek. The following student received recognition and a monetary award from the Soybean Council: Emma Connors. Additionally, Dayton Mayle received recognition and a monetary award in Water Environment Science. The following students received the Fifth-Grade Awards for Excellence: Alex Richards; Drew Roberts Nash Roberts; and Danica Stoffer. The following students received the Sixth-Grade Awards for Excellence: Sophia Talamonti; Gracie Crum; Noah Crum; Ella Maragos; Natalie Lucas; and Mackinnley Perkins. Those who served on the 2018 Science Fair Committee were: Rita Fulton, Professor of Biology and committee chair; Christopher Clantz, Associate Professor of Natural Sciences; Theresa Danaher, Principal, Bishop John King Mussio Elementary; Sandy Morelli, Bishop John King Mussio Junior High School; and April Woods, East Richland Christian Schools.